We all know that for trading in Indian equity, we need to open trading or broking account with the NSE/BSE registered broker or sub-broker and a demat account with the DP participant registered with NSDL or CDSL. But you require following things for opening above said accounts. PAN (Permanent Account Number) is now mandatory for opening broking, demat accounts and investing in mutual funds. You can obtain PAN online (FAQ) or approach your auditor or broker to get one. If you apply online it costs around Rs.65 and your auditor may charge you upward of Rs.200 for this service. Now a days all brokers and DP Participants are sending contract notes, circulars, trading tips and demat holding and transaction statements through email. Hence email id is must for opening trading A/c. You can open email ACCOUNT WITH Gmail, Aol, Yahoo, Hotmail, Rediffmail or Indiatimes. Register atleast two email IDs, one is for financial transactions and another is for personal use. My personal choice is Gmail and AOL. Net enabled bank account is required for transfer of funds to your trading account, withdrawing funds and to receive dividends. You enquire with your prospective broker for their tie-up with banks. I personally prefer HDFC Bank ( minimum balance Rs.5000) and ICICI Bank minimum balance (Rs.10000) as most of the Indian brokers have tieup with them. Those in metros can open ICICI Bank b2b bank account with Zero balance. You need two passport sized photographs, Copy of cancelled cheque, PAN Xerox, Xerox of passport or voter ID or Driving license or bank passbook or rent agreement or Ration card or Telephone bill or Insurance policy as ID and address proof. Union Govt. has published Revised Pay Rules in the Gazette. To download the revised rules please click here. For resolution containing Sixth Pay Commission report please click here. Bangalore based www.open2save.in offers information on 'best deals' from over 1000 retailers. If you want to purchase laptops, mobiles, LCD TVs, etc, do visit this site to get best deal. (lowest price). You can compare the prices prevailing at cities like Bangalore, Chennai, Delhi, Lucknow, Mysore, Mumbai, Pune and Online. Check yourself. MS announced the public availability of Internet Explorer 8 (Beta 2) today. It can be downloaded from here. Good News to Reliance Money Customers. 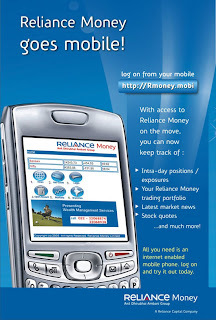 Reliance Money partially enables mobile access to it's customers. Visit http://rmoney.mobi in your GPRS enabled mobile browser. Login using your ID, Password and Security Token No. You can view your ledger, order book and live news. Currently it didn't support order placement or modification. Hope we will be allowed to place orders soon with wap access. India Infoline Ltd has conducted a study to search top dividend yield stocks across the BSE 500 universe and the results were interesting. Traditionally, high dividend yield stocks, are considered ‘Safe Havens’ . This happens more so when equity markets are in a bearish phase and growth stories are scarce. However, the pertinent questions to ask before buying are whether such high dividend yield stocks can sustain current level of dividends and are they insulated from capital loss (attractively priced on fundamentals). Indiainfoline did it's home work well and published it's results in a detailed report. A must read for all investors. • Pricing is excluding other charges like Custody Charges, Audit Fees etc. which will be charged annually on as is basis. Subscription through cheque drawn in favour of Reliance Securities Ltd.
Manager’s) regulation 1993 as may be amended from time to time. If you are still holding my earlier Nifty4300 Put buy call, Please book profit as I expect market would bounce back for short term. Imagine. You need to transfer Rs.10000 from your savings A/c held in SBI to you’re a/c held in ICICI Bank. Normally you will deposit SBI Cheque in the ICICI Bank (physically visit to ICICI Bank or ATM) or you can transfer money online through SBI online banking site. But ICICI Bank has introduced a new facility called “ Receive Fund”. You have to register (ONE TIME PROCESS) your other bank details at ICICI Bank website and take the printout of the debit mandate and sign it and get the signature of the other bank’s manger and submit it to any ICICI BANK branches. Your application will be approved within 21 days. Then whenever you require fund from other BANK A/C, you need to submit online instruction at ICICI bank’s online banking website and will receive the funds with in 4 days with out any cheque writing or physically visiting bank or ATM. I have received an interesting email from one of my friends. I didn't test any of the following points. try at your own risk. 1. The Emergency Number worldwide for Mobile is 112. If you find yourself out of the coverage area of your mobile; network and there is an emergency, dial 112 and the mobile will search any existing network to establish the emergency number for you, and interestingly this number 112 can be dialed even if the keypad is locked. Try it out. own a cell phone: If you lock your keys in the car and the spare keys are at home, call someone at home on their mobile phone from your cell phone. Hold your cell phone about a foot from your car door and have the person at your home press the unlock button, holding it near the mobile phone.on their end. Your car will unlock. Saves someone from having to drive your keys to you. Distance is no object. You could be hundreds of miles away, and if you can reach someone who has the other 'remote' for your car, you can unlock the doors (or the trunk). 4. To check your mobile phone's serial number, key in the following digits on your phone! : * # 0 6 #, a 15 digit code will appear on the screen. This number is unique to your handset. Write it down and keep it somewhere safe. When your phone get stolen, you can phone your service provider and give them this code. They will then be able to block your handset so even if the thief changes the SIM card, your phone will be totally useless.You probably won't get your phone back, but at least you know that whoever stole it can't use/sell it either. If everybody does this, there would be no point in people stealing mobile phones. I request you to updated the new/ original address in your reader. Sorry for the inconvenience. Old Feed Burner subscriptions may not work. Please update.
" The desire for constant action irrespective of underlying conditions is responsible for many losses in Wall Street even among the Professionals, who feel that they must take home some money every day, as though they were working for regular wages. " This quote is taken from "Reminiscences of a stock operator" by Edwin Lefevre, originally published in the YEAR 1923. I wish all the serious investors and especially traders should read this book for trading insights.
" I did preciously the wrong thing. The cotton showed me a loss and I kept it. The wheat showed me a profit and I sold it out. Of all the speculative blunders there are few greater than trying to average a losing game. Always sell what shows you a loss and keep what shows you profit"
and we will both get points! Scour, Inc., 15303 Ventura Blvd. Suite 860, Sherman Oaks, CA 91403, USA. As I am going to Chennai as External Examiner, there will not be any posts till August 15th. We shall meet after 16th. Happy Independence Day. May India become more happy, prosperous, strong and more self-asserting country. India Infoline believes that the Tier-II large companies (Satyam, HCL Tech & Tech M) are better placed than Top 3 (Infosys, TCS and Wipro) and could potentially deliver higher earnings growth over FY08-10E. As crude price is inching again to go past $120 mark, Indian market may go down sharply due to various reasons ( From Friday to US Market status). Buy Nifty Aug 4300 Puts for very sharp gains. I don't commit any investment purchase today. Yesterday's 100 points rally is due to declining trend global oil prices and short covering in Indian markets. My technical analysis software shows large number of scrips turning up. If market again rally 100 odd points in Nifty, then buy Nifty Aug. 4300 or 4400 puts . JPMorgan Asset Management India Pvt. Ltd. announces the launch of its JPMorgan India Alpha Fund, an actively managed scheme that aims to produce returns from a portfolio in an all-seasons environment, irrespective of the Market conditions / Index Movements. Aim to generate returns form a portfolio in an all-seasons environment Reduce the "market risk (beta)" by investing in "Stocks/derivatives with pair trades"
The JPMorgan India Alpha Fund will be open for subscription from 31st July to 29th August 2008. For offer document please click here. Clickhere for the quarterly update of HCL Technologies Ltd.
Network18 started a new free webmail service @ www.in.com . You can get your email ID as yourname@in.com with 10GB free space which is more than gmail and hotmail's offering. Book your favorite id now . Now Ebay.in announces 10% cash back for ICICI Bank credit card purchases and also you can avail interest free EMI. For more information please click here. Earlier ebay announced this offer only for ICICI Bank netbanking purchase not for credit cards. This offer is valil from July 31, 2008 up to September 30, 2008. For terms&conditions please click here.